Talking about F1: The F1 blog: Sochi Preview: Getting it right second time? It was host to the 2014 Winter Olympics and the Grand Prix existed cheek-by-jowl. 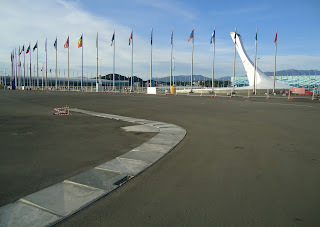 The track winds its way through the various gleaming sports buildings of the Olympic Park. This meant too that various facilities and infrastructure, such as those for the media, already were there. Smart. 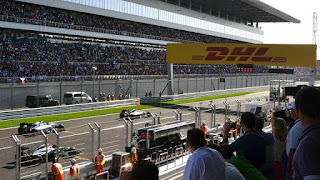 Yet even with all that waiting when the debut Russian Grand Prix of modern times finally arrived last year the freshman visit could scarcely have seemed worse timed. The event's very existence was controversial from several months out with unrest in Ukraine and allegations about Russia's contribution to it dominating many news headlines. There also were concerns more generally about Russia's human rights record and particularly its legislation prohibiting any 'positive mention of homosexuality' in the presence of minors. Perhaps underlining where the modern F1 calendar has got to Russia is by no means the worst place that the fraternity visits, yet all-in the country's profile and that of its President Vladimir Putin seemed to add an outer edge. Many indeed thought on this basis directly, or indirectly via the impact of the sanctions against Russia in response to the Ukraine situation, that the race wouldn't happen at all. around the circular medals plaza. But happen it did (as it was always going to given we know it takes a lot for Bernie or the FIA to halt these things - perhaps tanks rolling in...) and a few of the other worse predictions for the event didn't come true. The number turning out in the spectator areas was good, as was the weather. The venue too in that modern way was immaculately turned out, as well as even had a character somewhat against the norm. It had a touch of the original Montreal venue about it in dashing around an Olympic facility with futuristic, quirky architecture as its backdrop, just as the Île Notre-Dame track in its early days was accompanied by an array of weird and wonderful Expo buildings. The track circumnavigating the circular medals plaza, outlined by the elegant succession of national flags, was an excellent centrepiece. 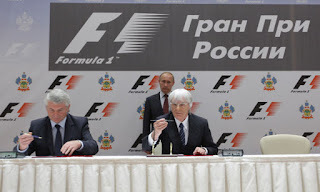 In these self-contained terms the long-awaited first F1 race in Russia had enough to be thought of as a success and there were reasons to think that F1 had set down a few first roots in the place. But still there was some grumpiness around, not least from the travelling band of journalists who seemed determined during the weekend to sneer at every opportunity, however tenuous. The venue was a long way from Moscow they noted, and the local town of Adler wasn't very exciting. They took particular exception to the quality of the local eateries (thus providing The Modern Journalist's Obsession With Oneself example number 272,367). It would prove to be another Korea-esque white elephant in time they thought with oracle-like certainty. That the race took place a matter of days after Jules Bianchi's accident in Suzuka hardly helped of course. Neither did that, with F1 again either showing ignorance or contempt for how it is viewed by the outside world, the aforementioned Mr Putin was given centre stage in the race's TV coverage on the world feed, on the podium as well as in the podium anteroom, a sort of appearance in the last case that I struggle to recall an equivalent of before. Sochi last time didn't give us a very good race either, although as with just about any Tilke track it featured a long straight with a big stop at the end, supposed to provide an overtaking opportunity (indeed the Sochi track had two of them). But the Sunday fare was tepid, related in large part to a couple of common curses of debutant venues, that the surface tends to be like glass (the bitumen of the newly-laid tarmac being near the surface) and that Pirelli tends to be cautious with its selected tyre compounds when visiting a track for the first time. 3.0 via Wikimedia Commons - https://commons.wikimedia. This time it indeed went to an extreme and combined to give us an old Bridgestone-type race with almost no variation in pace from tyre degradation and rubber easily able to last the entire race distance (one team predicted that one set of tyres could last 80 laps, in this 53 lap race). This was shown most starkly by Nico Rosberg who made his solitary stop on lap one, thanks to flat spots, and still was able to come through the field to finish second and with conspicuous comfort. He even, in something near-unheard of in this Pirelli era, passed Valtteri Bottas for that second place on tyres that were 25 laps older and were of the same compound. In an apparent gross miscalculation, Pirelli thought in advance that two or three stops each would be the norm. In another parallel with Montreal the circuit was tough on fuel consumption too. For most therefore the race was an economy run, summed up by the words of Kevin Magnussen afterwards: "It was almost like a chilled-out Sunday drive, in fact, because I was easing off the power 200 metres before the corners in an effort to save fuel. I was really surprised that no-one was able to catch me, in fact; I guess the guys behind me must have been experiencing the same problem" (the length of some of the support races had to be reduced for this very reason too). This further deadened the entertainment. The expected safety car, which may well have livened things up, never arrived either. But if you're giving up on the impending Russian race at this point then there are reasons to stick with it this time. Really. Pirelli learning from last year have gone as soft as they can, with the supersoft and soft compounds brought this time. Further the surface should be a bit rougher for the reason given. These factors will be compounded (pardon the pun) by making teams step somewhat into the unknown even after their experience garnered last year. The lingering turn 3 too was also expected to tax the tyres, particularly the front right, and it will be interesting to see if this happens this time in more standard conditions (indeed some experienced front tyre blistering even last year). Teams will still be doing their best to avoid multi-stop strategies as the pit stop loss time is one of the biggest of the year at 29 seconds - last year indeed the pit lane speed limit had to be lowered due to it being tighter than expected. This will further add to the strategists' headaches. Then there is what happened the last time the supersoft and soft tyres were used. At Singapore. A track with a low grip surface like Sochi's. And then, yes, F1 as we know it was turned on its head with the the usually contemptuously-dominant Mercs reduced to also-rans. Even now it's not clear if the Brackley team fully understand why its cars dropped from the pace incongruously that weekend. Mercedes will therefore be nervous and the ever-frank Niki Lauda has admitted as much. Ferrari and especially the Singapore victor Sebastian Vettel you'd have thought will be fully intent on making Merc's life as unpleasant as possible. 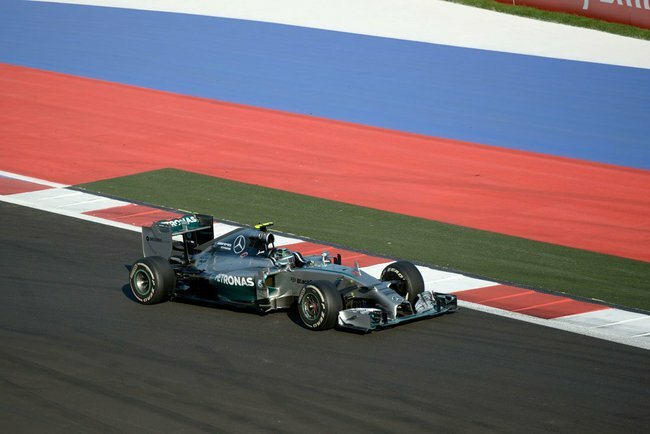 The Mercedes team though this time at least can be assured that the Sochi track will allow the silver cars to stretch their legs more than Singapore's did, particularly with its two long straights. The lengthy turn three should help the W06 get heat into its tyres too. Last year the Merc-powered Williams also was strong here, or at least it was in the hands of Bottas, and he indeed looked like he might grab pole position only for his tyres to run out of life before the end of his final qualifying effort. Long range forecasts even have rain showers around for race day... Plus in this game even notorious F1 ugly ducklings can turn into very fine swans indeed. Heck, even Valencia (a track that a few compared Sochi with 12 months ago) gave us a classic eventually. 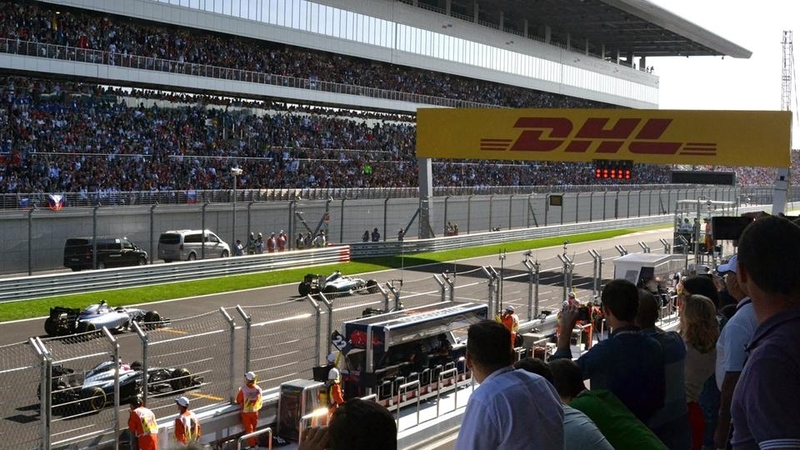 It may be another thing easy to miss with everything else that's going on, but there are a few reasons to think that this time the Russian Grand Prix will give us a bit more worth watching than was the case in its rather inauspicious debut.